A second post in less than a week?!? Miracles do happen! Yes that's right, I'm back with another post that I hope you like, as well as a new blog layout! I fancied a bit of a change since I was fed up with what I had before and while I still have a few tweaks to do, please let me know what you think. Moving onto the nail art at hand, I've been wanting to show off this GORGEOUS shade from CND for ages. I actually trialled this a good few weeks ago but didn't get around to taking pictures but I'll still discuss the results below but continue on to read more about the shade that just gives me all of the Little Mermaid feels. 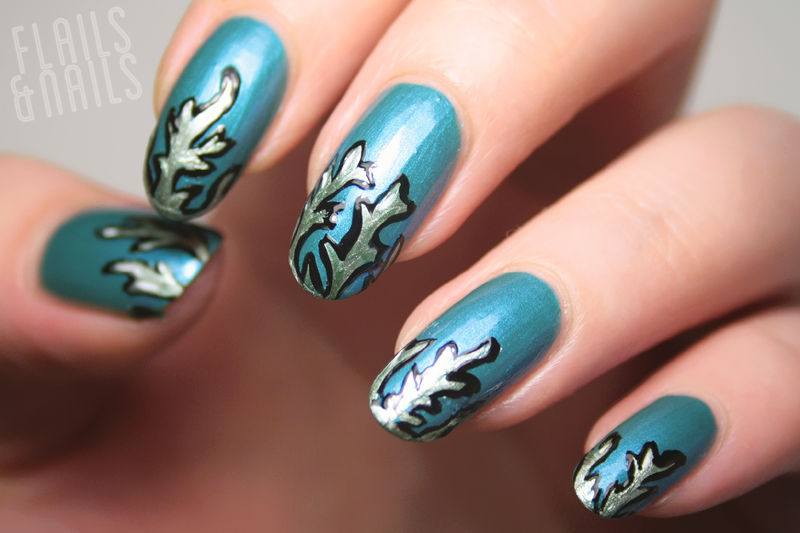 Like I mentioned before, Lost Labyrinth reminds me of The Little Mermaid for whatever reason so I had to go for an underwater theme with my nail art. I went with seaweed because I really wanted to use Models Own Green Chrome as my accent colour because I thought the two shades would work really well together. I used my detail brush for the body of the seaweed and my fine detail brush for the outline work. The green of the shade does not stand out as much in the photograph as it does in person but they do complement each other nicely. The above swatch of CND Vinylux Lost Labyrinth is two coats and that's at full opacity. The first coat comes off a bit patchy but don't worry because the second coat smooths everything over for an even finish. The Vinylux range from CND runs in conjunction with their Shellac range, in that they are made up of the same shades with the premise being that for whatever reason if you needed to touch up your shellac but didn't want a whole new manicure, you can do so with the Vinylux polishes. The Vinylux polishes themselves are branded as a weekly polish, meaning it should last seven days without chipping and this is with the CND Vinylux top coat. 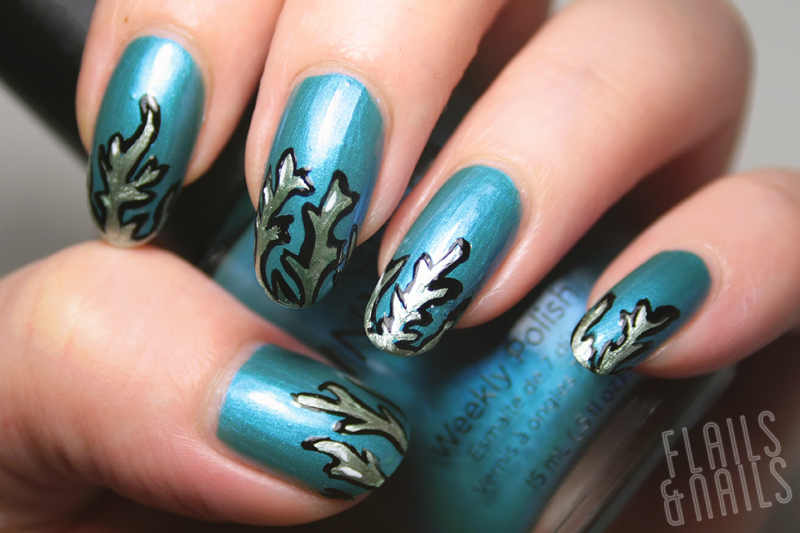 I tested this out a few weeks ago to see whether the polish stands the test of time. During my trial of the polish and top coat (not pictured), I suffered one chip during the entire week over both hands. That chip was actually the nail coming away as well, not just the polish when I tried to open something tough (can't remember what) and this happened pretty early on in the week. I didn't really blame the polish for this since it was not just the polish but a chunk of nail that was removed also, On the seventh day of the trial, I had some minor tip wear and that was it. While the polish and top coat are not 100% foolproof for the week, their lasting power is definitely there and better than other gel-like polishes out there so I think if you're a fan of CND Shellac but wanted to give your nails a bit of a breather without missing out on colour on your nails then definitely check out this shade and the Vinylux range in general. 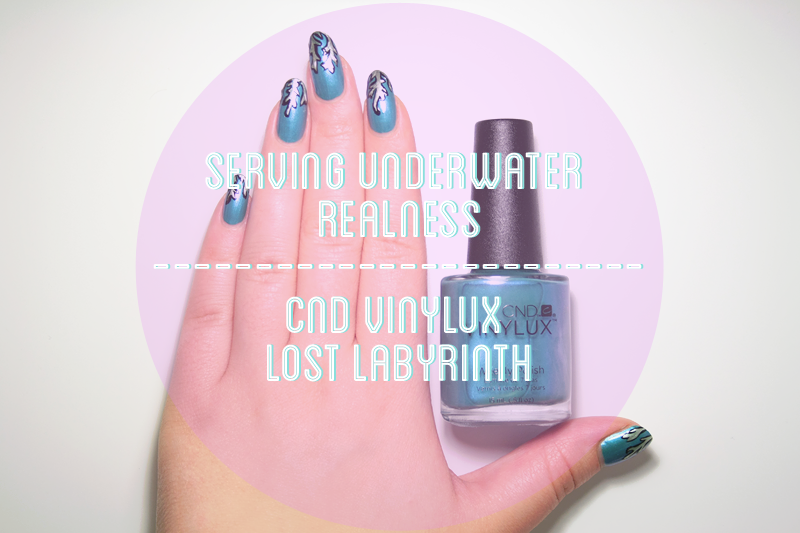 CND Vinylux Lost Labyrinth and other shades are available from Sweet Squared as well as CND stocked salons across the UK and Ireland. Also loving the new look of Flails and Nails! I adore the black outline you added because it highlights the design but also allows the colours to work even better together!